We offer Whole Leaf Organic Oolong tea from famous organic tea gardens like MIM (Andrew Yule) in Darjeeling and Coonoor Tea Estates. The Whole Leaf teas need to be used 2-3 times over 6-8 hours. 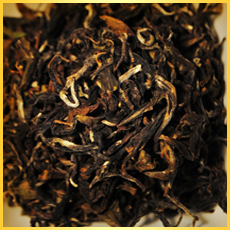 Darjeeling Oolong Classic: These are available in a pack of 50 Gms, 25 Gms and a pack of 20 pyramid shaped teabag packs. The whole leaf teas require a lot of space fur unfurling/expansion during brewing and the normal teabags don't allow such space. Therefore, we use a pyramid-shaped teabag. Coonoor Oolong Classic: These are available in packs of 50 Gms. We also have Oolong tea with Apple flavor. You can buy all these teas through our online store. Oolong tea is often called a weight loss tea because it helps burn fat built up in the body. While such claims are not scientifically established, a lot of information on the internet indicates these health benefits. Oolong tea is often considered the most difficult tea to process as oolong leaves are only partially oxidized. The leaves cannot be broken or crushed, as full oxidation would occur, so they must only be bruised. Once the veins become clear and the edges of the leaves become reddish brown, while the center remains green, the oxidation process is stopped by firing. These leaves are oxidized anywhere between 10% to 90% level. The oxidation period for oolong is half that of black tea which makes it a more powerful antioxidant. Oolongs can be more like black teas or more like green teas in their fermentation. How did Oolong Tea get its name? The tea gets its name from the Chinese word "we"--"black", and "lung"--"dragon". Still, the tea is more commonly termed as "oolong". There is a variant called "Green Oolong" where the oxidation level of tea is closer to "green' tea and are less oxidized. Oolong tea has a refreshing and aromatic taste. Most good oolongs have an intense floral aroma and a remarkable peachy flavor. Others have a vegetative quality like that of green tea. Oolong tea is rich in antioxidants called polyphenols - or tannin - which help prevent cancer. Tannin is known for its ability to help DNA cells reproduce accurately, thus preventing abnormalities from forming. Other health benefits of drinking Oolong tea include reduced heart disease, better digestion, and lowered cholesterol accumulation. In short, drinking oolong tea can improve a drinker's life on several levels. Oolong helps with digestion and lowers cholesterol. This tea also has weight loss benefits.